This can be done in 3 ways. Firstly Min and max prices as well as all other settings can be set manually via the listings tab. Though to save time we can set min and max prices in bulk too. Setting your min and max price is an essential safety measure which you need to do before Seller Bay Republic starts repricing your listings. It prevents listings from going below (or above) what you are prepared to sell them for. This can be done in less than a minute though we recommend checking listings individually, just to be sure you are happy with the prices set. Starting on the listings tab we can choose 'Set Min/Max Prices by Percentage to Multiple Listings'. A common scenario might be that you want to reprice goods up to approximately 10% below your current selling price and 10% above your current selling price. To do this you would input 90 in the min price box and 110 into the max price box. To take more control of your min and max prices it is a good idea to use our CSV method. 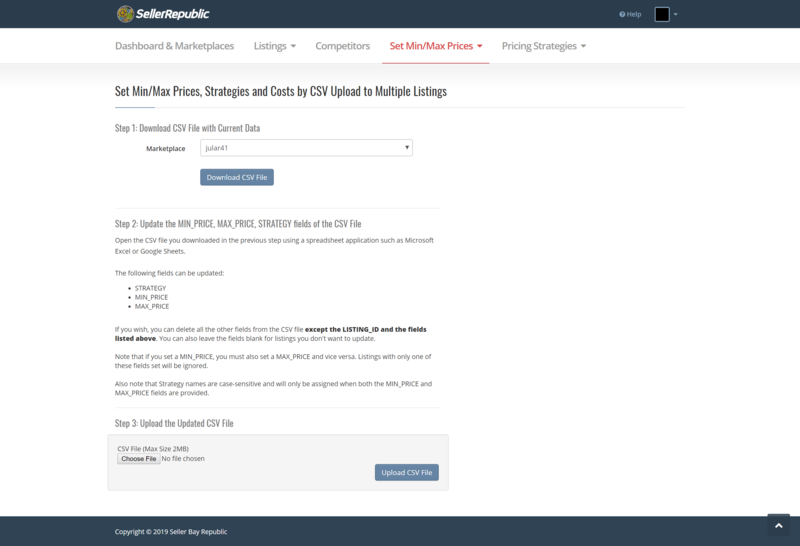 To access this go to Set Min/Max Prices and Cost by CSV Upload which can be found in the listings menu.Choose the regional marketplace you would like to amend min and max prices for and Click 'Download CSV file'. Open the CSV file if it does not automatically open. Columns H and I (MIN_PRICE and MAX_PRICE and STRATEGY) are editable on per product basis allowing you to go through and set these in bulk. These 3 fields are required: LISTING_ID, MIN_PRICE, and MAX_PRICE, you can have them in any order, other columns can be deleted. Once finished save the file and Upload the Updated CSV File on step 3.